Keyboard players have always had to live down that joke about being able to play bass with their left hand, which is true. But it doesn't mean that we don't need or want bass players, or drummers, or guitarists, or...a full band, even. And with how hard it can be to find the guys who are willing to stick to the parts we write, I know some of you out there will be glad to see the BK-7m Band-in-a-Box module coming to stores. Even if you already have a band, this suddenly becomes a great way to teach your bandmates their parts without having to write it all out or painstakingly show them tablature or give them every note individually. For keyboardists who don't have or don't want a band, it's a way to fill out your sound by yourself and create full demos in your home studio. On top of all that, it's still a high quality sound module. A little smaller than a hardcover dictionary, the BK7-M packs in over 1,000 tones, 57 drumkits, and compatibility with any MIDI-capable pianos, keyboards, organs, or accordians; it's even compatible with GM2, GS, and XG Lite MIDI voicing styles. There are also over 400 genres to select from and over 900 musical assistants covering many genres of music to add accompaniment to your tunes. If you aren't satisfied or just can't quite find the right sound in all of that, feel free to edit or create your own patches and store them on external USB memory via the BK7-M's USB port. The BK7-M can play just about any type of audio file from USB flash drive or self-powered hard drive, and it includes full support for SMF audio and cover formats. 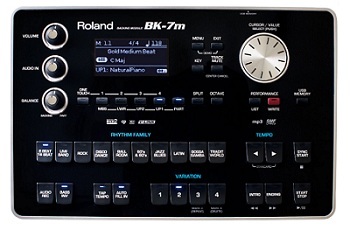 The BK7-M can also become something of a karaoke machine, with a composite video output available to display chord symbols and lyrics if you so choose. The Center Cancel function hones in on the vocal track in the performance and cuts it out so you can even sing over top of your favorite performances. Onboard controls let you change the key and tempo to best suit your vocal range or performance style of choice. You can also use the USB port to record your performances straight to audio while you play in 44.1kHz/16-bit linear format WAV files. So feed the BK7-M a MIDI, WAV, Mp3, SMF, or other audio file and jam away knowing you sound like a full band. And since the BK7-M can track up to 128 voices at a time polyphonically, you need not worry about dropping notes or overloading it as a sound module or small recording studio. This box takes all-in-one to a new level.